The extensive community of Jupiter River Estates, located on the northern part of the Loxahatchee River, showcases diverse types of luxury single family homes. Home sizes range from three to six bedrooms and 1,800 to over 6,000 square feet of living space. Some residents have their own deep water docks giving them easy access to the calm waters of the Loxahatchee River. Dining, shopping, sandy beaches, the Florida Turnpike and I-95 are all easily accessible. 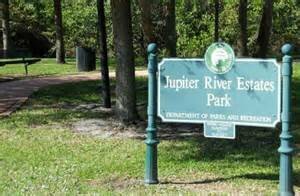 Jupiter River Estates residents are zoned for A rated schools. Awesome Riverfront Home with all the water activities you can handle. Spend countless hours having fun in the sun in your private tropical paradise with Intracoastal and ocean access, great fishing and boating right out your back door. This home features 3 bedrooms, 3 baths, impact windows, 2 car garage, plenty of storage, granite tops in kitchen, resort style pool and patio and much more. This home will not last.